Among those attending JKLM tour of its shale gas drilling sites were, from left, Pete Ryan and Bob Volkmar from Trout Unlimited and the Upper Allegheny Watershed Assn. ; Potter County Conservation District staffers Jason Childs and Jared Dickerson; and Sweden Township Supervisor Jon Blass. While most shale gas drillers with holdings in Potter County have been idle, JKLM Energy continues to move forward with an ambitious plan to deliver natural gas found deep underground in Utica Shale formations to the national pipeline network. 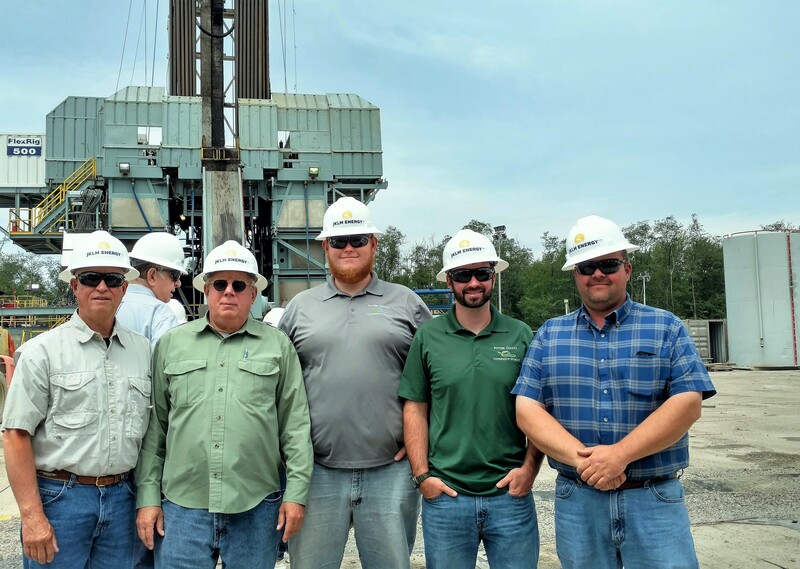 The company recently hosted county and local government leaders, representatives of conservation organizations and other guests for a guided bus tour of its Potter County shale gas drilling sites. JKLM is unique, in that all of its operations are in Potter County, where the company has about 120,000 acres under lease. At the midpoint of 2017, JKLM officials report, the plan to drill approximately a dozen more wells this year is on course. Six of those have been drilled and three have been completed as of mid-June. That brings the company’s total activity in Potter County to 14 wells drilled, six completed, and four now producing gas. By the end of the 2017, the company plans to drill seven more wells, complete 10, and put two more wells into sales. Additionally, JKLM plans to commence several pipeline projects this fall. JKLM officials said they’re pleased with the volume of gas that is being found in the deep shale layers and the company expects to have a presence in the county for years to come. For now, the company is concentrating its efforts on Sweden, Summit, Ulysses and Eulalia townships. Additional locations in Hector Township and other areas could be developed in the future.